On a gloriously sunny afternoon we drive out into the Sussex countryside, eventually turning off the main road along a wooded drive, approaching the long, low façade of a country house, situated at the centre of a stunning Capability Brown landscape. We leave the car and continue on foot, eventually emerging through trees onto the lakeside where a man and some boys are pushing a small boat out onto the water. Another boat is far out on the lake, rowing close to a giant ball of tangled wood. The ends of loosely woven timber strips protrude unevenly from the object, disrupting its outline, marking its maker’s refusal to be bound by the rules of convention and creating a sense of energy.I had been to this place before in very different weather, on a day when cold rain dripped through the leaves, and the steep steps up to an unheated loft space were slippery with moisture. This was the place that Felicity Truscott had made her base during a year-long experiment to discover what might happen if nature was allowed to direct and govern her art-making. 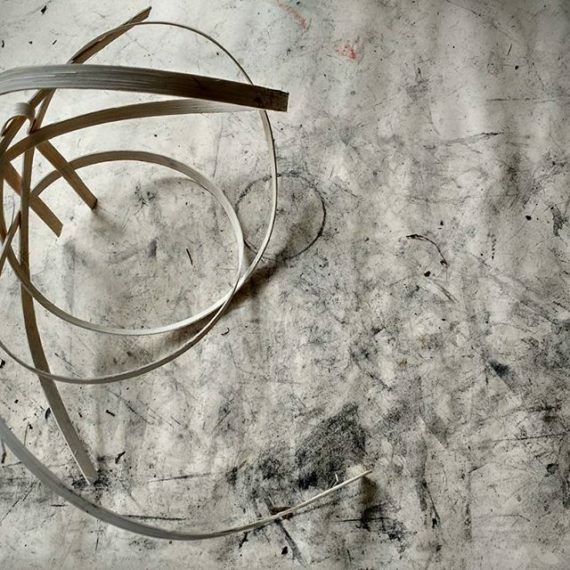 At the time of this first visit the little studio was crowded with drawings – rhythmic charcoal loops and energetic spatterings of ink; scoured chalky paintings stood propped against flaky walls. A spiral of swept ash covered the floor, the broom that had made it leaning to one side. All of these works were created with a dynamic physicality typical of Truscott’s practice. They echoed the movements in the landscape – spiralling leaves, swaying reeds, rotating eddies made by wind on water, the ever changing patterns of sun and shade, dark and light, marking the cycles of time and life. The Oxford Dictionary defines revolution not only as “an instance of revolving”, but also as “a forcible overthrow of a government or social order, in favour of a new system.” For Felicity this project formed part of a revolution in her practice as she searched for new meaning in her work, and challenged herself to find ways of responding to the energy of the natural world through her own physicality. There was a need to create work on a new scale and in a form that could sit within the landscape, not separate from it, acting as a force which would somehow amplify the energy of the environment in which it was born. strips, not long since part of a living tree, were hard to manage: while one end could be brought under control, the other flapped and flailed. 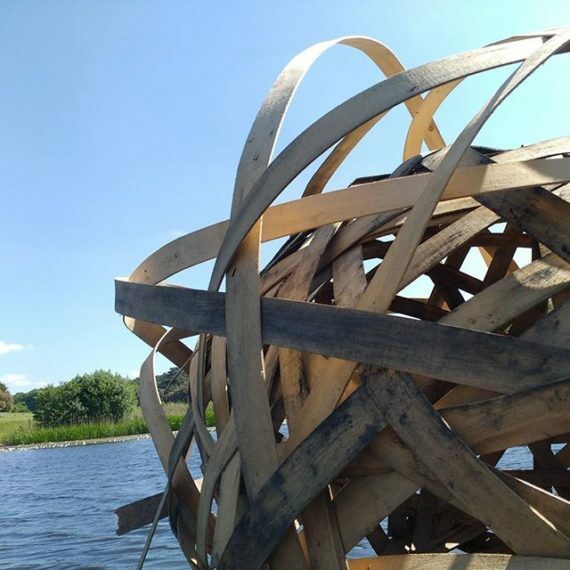 Eventually, woven under, over, under, over, the strips of oak were forced to submit and a roughly spherical shape began to take form. Pushing against each other the slats set up a tension, the woven mesh began to dry and the wood shrank, self-locking into a taught sphere. Finally tamed, the object was rolled down the sloping grass to the water’s edge and onto a floating raft. Plastic canisters filled with air were lashed to the underside of the raft, supporting the object at the exact point, on the surface of the water, where the world above met the world below. mission has almost been accomplished. 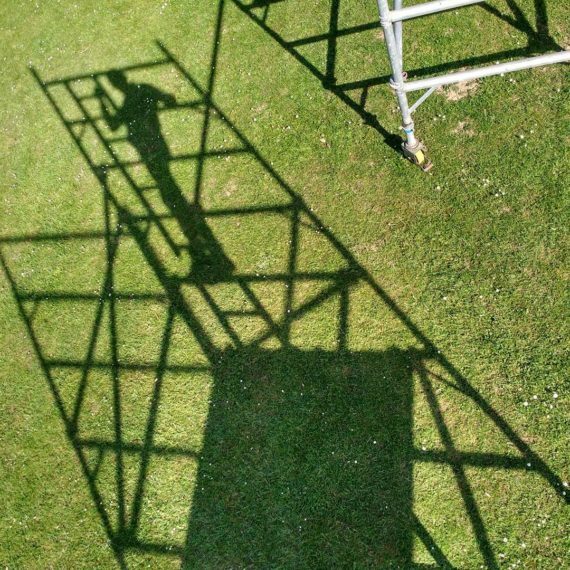 In another Capability Brown landscape 160 miles away at Compton Verney, there is art in the parkland. One of Brown’s artistic devices was the use of viewpoints to draw the eye; now the landscape becomes a magnificent composition in which works of art such as Henry Moore’s iconic sculptures can be framed and admired. Sometimes however, the art becomes a means to view the landscape differently, or to disrupt the view. 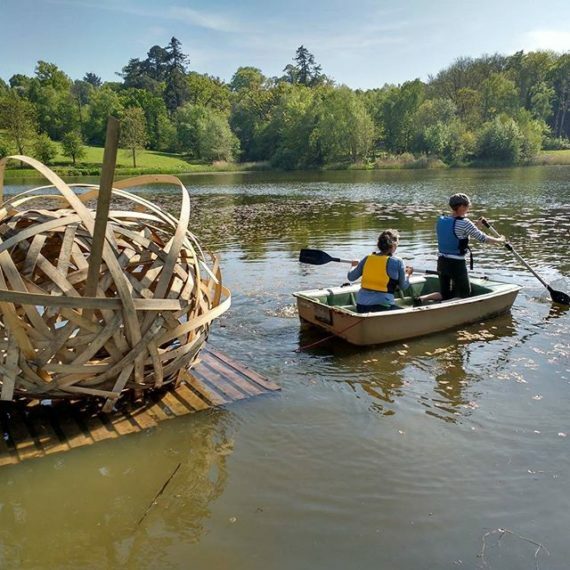 In Hilary Jack’s Empty Nest, a giant nest- like structure constructed in an ancient Cedar of Lebanon tree overlooking the Compton Verney lake, visitors climbed up into the sculpture to experience the landscape from a new perspective. Previously, in the same setting, Simon Patterson’s installation, Landskip, released plumes of brightly coloured smoke across the parkland, creating dramatic clouds of colour which dispersed into an incongruous tinted haze. 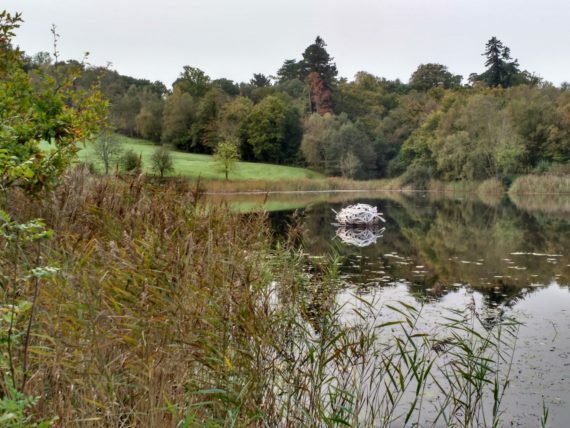 To the visitor approaching the lake at Ashburnham Place, Truscott’s floating intervention provided an unexpected interruption to the view, prompting the viewer to pause a moment to reflect and question. shape as the weather worked away at it. But how to end? Reluctant to leave the object to a process of slow deterioration and collapse, Truscott debated: sink or burn? Before the final act though, there is one more exploration to be made: a foray into the world beneath. A video camera is lowered on a rope, into the depths, down to the lake bed. The film footage captured during the slow immersion and re-emergence triggers an urge to revisit Bill Viola’s film works with their themes of ritual immersion, near death experience, rescue and re-birth. Or Simon Faithful’s work, Reef, which explores the cycles of life and death in a less direct way, charting the sinking of a small boat, the Brioney Victoria, and her transformation into a new habitat for sea creatures to populate. Finally, there is no more to be done and the decision is made. Burn. 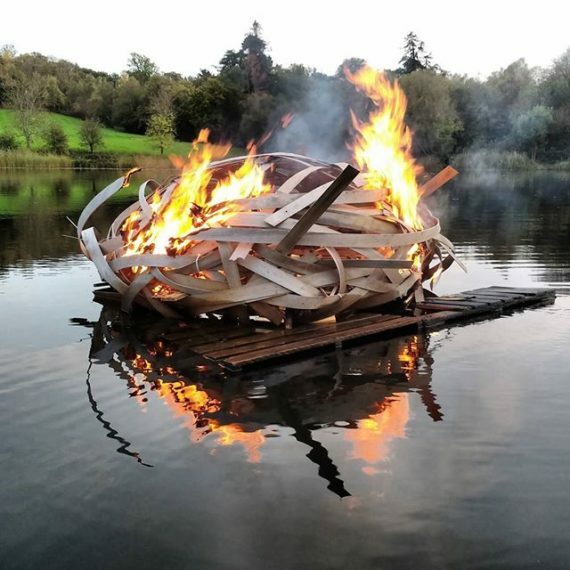 A last dramatic act as the sculpture becomes a funeral pyre floating on the glassy surface, completing what has perhaps become a rite of passage; a journey of transformation through air, water and fire. The project has brought to mind thoughts about control and restraint, adventure and risk; about the relationship between mankind and nature, the known and the unknown, the inevitable cycles of birth, life and death, and of celebration and mourning.